News: London is set to offer a rival to New York's acclaimed High Line park with these competition-winning proposals for a landscaped promenade linking gardens and railways arches along the River Thames. The competition, set by the RIBA and local organisation Vauxhall One, asked architects to "create an outstanding new addition to the urban environment" within a district of Nine Elms, along the South Bank. 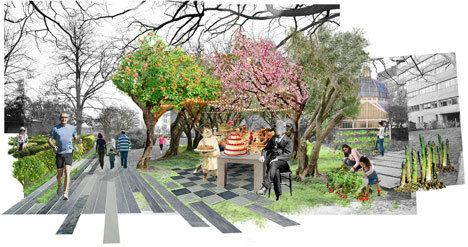 The winning entry from Erect Architecture and landscape architects J&L Gibbons is influenced by the Vauxhall Pleasure Gardens, an amusement park that was a popular location for promenading and entertainment from the mid seventeenth century to the mid nineteenth century. A contemporary promenade will link major hubs within the site, with a series of permanent and temporary installations along the route acting as "curiosities" to emulate aspects of Vauxhall's history. Rain gardens will provide sustainable drainage along the pathways, which will be composed of different textured paving to provide variety throughout the scheme. 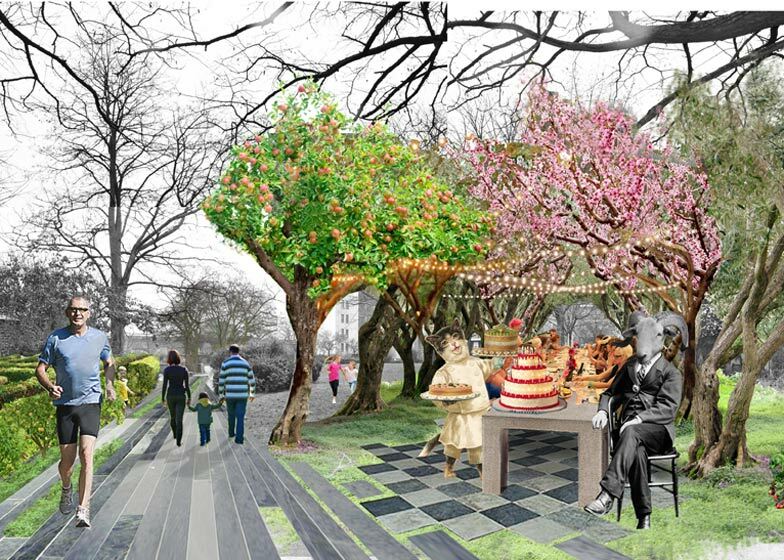 Chris Law, public realm and development director for the Vauxhall BID praised the imagination of the winning entry: "Rain gardens mix with strangely pruned trees to create a real Cabinet of Curiosities. So Vauxhall! Who would have thought that sustainable urban drainage could be so cool!" The public spaces are located within a larger masterplan for the Vauxhall Nine Elms Battersea (VNEB) area, which includes the transformation of Battersea Power Station into a mixed-use development and the building of the new US Embassy. The park will hope to replicate the popularity of the High Line, which first opened in 2009, with the second section opening in 2011. In a movie filmed on our recent trip to New York, designer Stephen Burks told us that the High Line is helping to transform the architecture of the surrounding areas. Italian architects Massimiliano and Doriana Fuksas recently proposed an elevated park above a railway line in the Italian city of Bari – see more design for parks and gardens. Following a unanimous verdict from the judges, the winner of the RIBA and Vauxhall One’s international design competition has been announced. London based Erect Architecture and J&L Gibbons will now work with Vauxhall One to re-design the public realm in the Vauxhall area of Nine Elms on the South Bank. Over the last month the three shortlisted entries have had a chance to expand their initial ideas, along with a Green Infrastructure Audit from the Mayor’s Office, before presenting back to the judging panel. In winning the competition Erect Architecture have landed a five year programme of work in which they will work with the Vauxhall One team to realise their plans. The winning plan demonstrated understanding of the site, history and context, offered exceptional design flair and innovation, and exhibited excellent understanding of Green Infrastructure. In addition the design was quirky and fun. 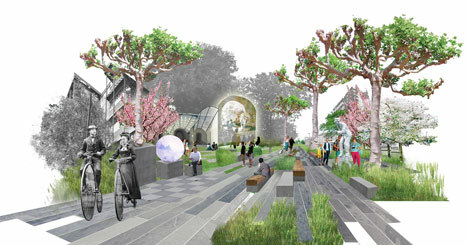 The design entitled The Promenade of Curiosities, focuses on the creation of a Vauxhall Walkway and improvement to the Vauxhall Gardens and Railway Arches. The competition was judged by a panel of high profile figures (including Sue Illman, President of Landscape Institute, Stephen Crisp, Head Gardener to the US Ambassador, Christopher Woodward, Director of the Garden Museum and Doreen Lawrence, mother of Stephen Lawrence) and entries were judged on a number of criteria including opportunities for green intervention, inventiveness, viability and complimenting of existing planning to ensure a joined up and considered public realm for the entire area. The aim is to create a striking new identity for the area in and around Vauxhall - a stretch of land dubbed the ‘Missing Link’ between the new US Embassy and London’s South Bank. Vauxhall is at the heart of Nine Elms on the South Bank, the £15 billion opportunity area between Lambeth Bridge and Chelsea Bridge which includes Vauxhall town centre, the new US Embassy and Battersea Power Station.